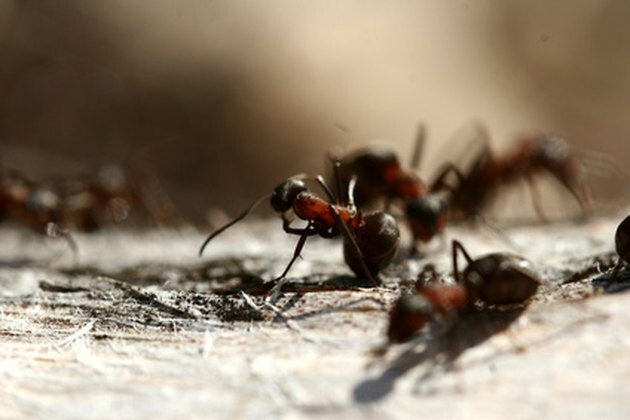 Several methods exist for killing ants crawling on your granite countertop. Both chemical and natural methods work. As with any bug, stopping the problem at the source is important. Find the anthill and destroy it with chemicals or boiling water. Seal up gaps in doors and windows to keep the ants from crawling inside. Ants travel on countertops to find food crumbs. Most people prepare, serve and store food on granite countertops. These practices cause crumbs to be left behind. Kill ants on your granite countertop. Remove all dishes, food and debris from the countertop. Throw out crumbs. Spray the counter top with an all-purpose cleaner like Lysol or Clorox. Wipe clean with paper towels or rags. Spray the ant killer on the window ledges, doorways and any other area you see ants crawling in to get to the granite countertop. Don't spray the countertop itself. Sprinkle chili powder over the granite countertop. Leave the chili powder on the countertop overnight. Spray the granite countertop with all-purpose cleaner. Wipe clean with paper towels or rags. Spray the counter top with vinegar. Wipe clean with rags or paper towels. Spray your counter with vinegar every day to stop ants. Pour 4 or 5 drops of liquid dish soap into a spray bottle. Fill 3/4 full with water, and screw on the lid. Spray the ants to kill on contact. Draw a chalk line around your windows, and if you can tolerate it, around the edge of your counter where it meets the wall. The chalk line stops the ants from entering the house.